I'm building the wings on my 650 and the fuel return fitting in on the outboard end of the tank, I talked with Zenith and they said something about that end is better to prevent condensation from getting into the tank from the return line??? Anyway, instead of running a long fuel return line outboard to the next lightening hole I'm considering welding a return fitting in the upper inboard end of my tanks. In a previous blog about the ULPower engine in the 650 there was a discussion about fuel use. Since these engines use fuel to cool the injectors and send the excess fuel by return line back to the tanks I was wondering how the GPH fuel use is determined. Seems that a fuel flow sensor in the line to the engine would not give a correct reading. Just wondered how it was done. Well summer and fall came and went and I didn't do a darn thing on the plane...debating on whether to get my materials ordered so I can work on stuff over this coming winter. But will I have time? Home repairs and other life setbacks have really gotten in the way! I'm probably the last person to catch on, but I recently bought this Olfa P800 knife for trimming skin edges and it is fantastic. No more snips and scotch brite for me. 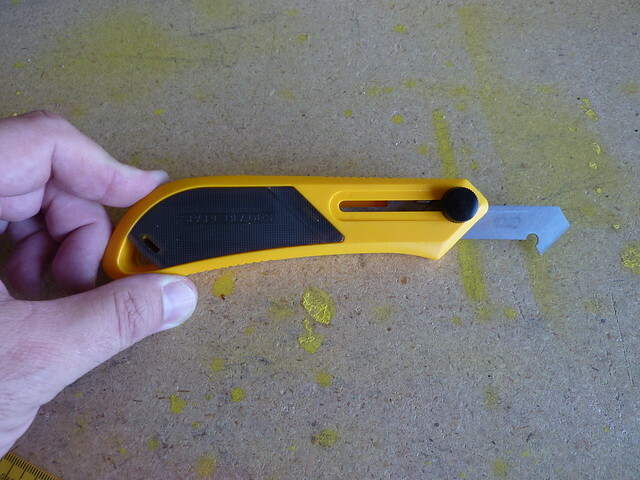 Have to thank plane builders for sharing their tips online and unwittingly guiding me to the right blade. What is the best propeller to put on ch701 with jabiru 2200 engine ??? What should the rev-counter read at full throttle when taking off and climbing ??? I can only get to 2600 rpm maximum throttle which I think is not enough. Any information will be appreciated.